I was in Berlin when Germany won the World Cup in 2014. Fireworks, street parties, singing, dancing and lots of flag waving all spoke to a joyous national celebration – the due of any victor in international sport. There is some irony, then, in this week’s stunt from German consultancy Euro Informationen. The company, whose clients include the European Commission and European Parliament, has produced a new Olympics medals table which puts the EU at the top. The absurdity as well as the diplomatic idiocy of this gimmick is obvious. The EU – as any of its bureaucrats will proudly drawl – is not a country, it’s a bloc, and the Olympics does not award medals to blocs, much as Fifa does not. 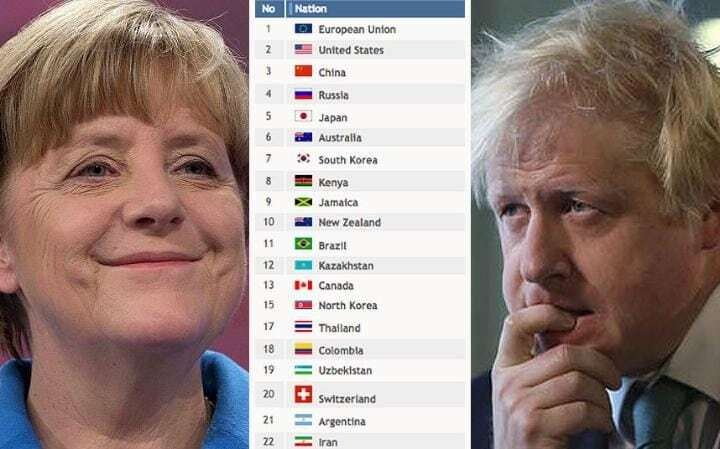 But the truly amusing irony is that this ghastly competitor tops the chart largely because of the incredible medal haul of Britain, the very country it is currently absorbed in shaming and punishing for its rankly disobedient vote in June to leave the EU. While this reading of Olympics victory is amusing, mainly for its whiff of “sore losers”, its underlying impulse is far more sobering. For it is the perfect manifestation of the EU’s obsession with conformism and its visceral distrust of individualism – national or otherwise. When it comes to the EU – its commissioners, MPs and a large body of unaccountable, long-lunch taking, lurking elites – it’s always a case of “you’re with us or against us”. In fact, there isn’t really a choice in the matter. Even popular democratic attempts to go ‘against’ have a history of being ignored. Famously, in 2005, the French were offered a referendum on whether to ratify a European Constitution. After much thought, debate and a huge turnout, they voted against. So did the Netherlands. So the EU did what any power-crazy bloc would do, and put it through anyway, packaged as the Treaty of Lisbon. A decade on, the French people are well and truly fed up of the EU, of its quotas, its rules, its diktats, its suppression of national free will. A 2015 survey found that a whopping 67 per cent of French people would get out. And we all know what happened when Greece tried to disobey Brussels in 2015: to stave off Grexit, the EU dished out a punishment so brutal it involved the country’s full surrender of economic power and the hobbling sale of €50bn in assets. The EU may have broken Greece’s spirit. But the British vote to leave – following endemic inflexibility in negotiations with David Cameron last year – sent an unexpected and irreversible firework up its backside. The machine cranked into action: rather than bend an inch, or rethink itself, it opted for an attitude of punishment, hoping to further suppress the discontent of other member states. Post-Brexit, EU Commission president Jean-Claude Juncker immediately called demands by other EU nations for referendums “crass rabble-rousing” and sinisterly swore that it ‘should soon become clear that the UK was better off inside the EU’. The EU’s need to punish individualism and stifle dissent may have bullied the bloc into continuance so far, and the symbolism of its attempt to grab all the Olympics glory as one bland federation is clear. But sorry Brussels, in this case you lose: it’s America first and, amazingly, Britain second, and no amount of huffing and puffing is going to change that. August 19, 2016 in EU Erosion.